The Office of Mission and Ministry invites you to take a break from your daily routine and visit some of the sacred spots on these grounds. Refresh your spirit and learn a bit about the Sisters of St. Francis and our Franciscan traditions. The year was 1206 and the place was Assisi, a little town in northern Italy. A young man named Francis had just decided to leave home and family because he sensed that God was calling him to a different way of life. Francis found himself in a position that may sound all too familiar to many of us: he knew that God was calling him to something but he didn’t know what that something was. While praying one day, Francis heard the voice of God asking him to, “Rebuild my house.” He took the message quite literally and began to repair some of the little village churches that had been neglected. The church of St. Mary of the Angels, also known as the Portiuncula (the little portion), was one that he rebuilt. 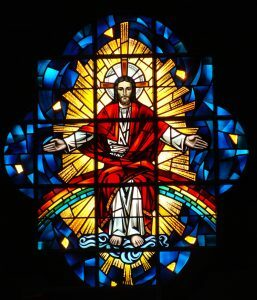 Francis approached this project with boundless energy and passion, but he soon came to learn that God was calling him to ”rebuild” the people of God. The chapel remained dear to the heart of Francis and his companions. The brothers came here to find some peace after spending time amid the hustle and bustle of the marketplace. Here, Francis called his brothers together to renew their bond of community and to tell one another of the marvels that God was working in them and through them. This was truly their own little portion in the world. As Francis neared the end of his life, he asked to be brought back to the Portiuncula. It was in this place that he had first learned of God’s ways, and it was in this place that he wished to give his soul back to his Creator. Francis had found such peace throughout his life that he could welcome even death as a dear sister. Our own Sylvania Franciscan Portiuncula was modeled after this chapel in Assisi. 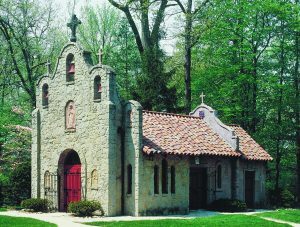 Built in 1936, it was commissioned by our founder, Mother Mary Adelaide, in gratitude to God after the Sisters had survived a serious financial crisis which almost resulted in the loss of our home here in Sylvania. It remains a sacred space set aside for quiet reflection. Here you are invited to come away from the noise and confusion of your own “marketplace” and reflect on the marvels God has accomplished in your life. You are invited to spend quiet time in this chapel which is open daily for private prayer from 7 a.m. to 5 p.m.
Francis of Assisi saw himself as a messenger of God’s peace. He greeted all those whom he met with the simple phrase, “May the Lord give you peace” (1 Cel 23b). Yet Francis knew that peace was more than a matter of words. He used to tell his brothers, “As you announce peace with your words, make sure that greater peace is in your hearts…for we have been called to heal the wounded, to bind up the broken, and to recall the erring” (L3C 58). 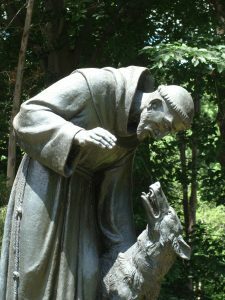 According to the accounts told by his companions, one time Francis was staying near the village of Gubbio when a large wolf approached the city and began to terrorize the people. The men of the village had planned to hunt for the wolf and to kill him when Francis offered to mediate the situation. Francis and his companions, armed only with their trust in God, went in search of the animal. 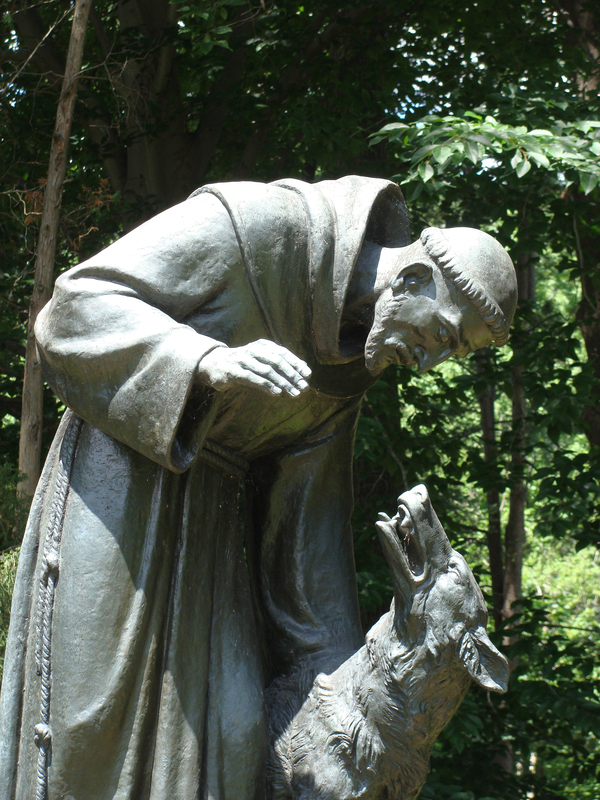 When they found him, Francis rebuked the wolf for harming the townspeople. Francis, however, also realized that the wolf was hungry and looking for food. People often ask about the origin of the name of Lourdes. Well it all began with the community of women religious who sponsor the institution, the Sisters of St. Francis of the Congregation of Our Lady of Lourdes, Sylvania, Ohio. 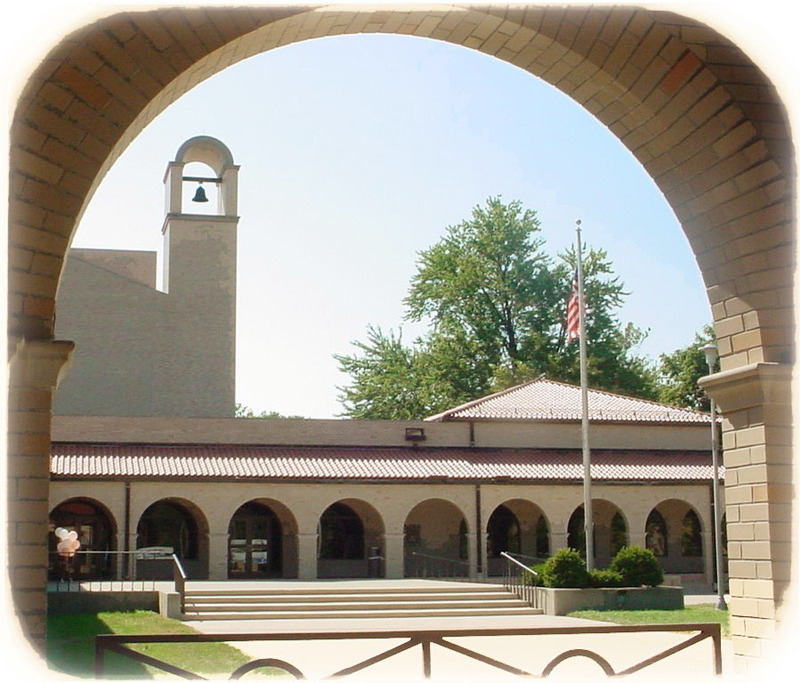 Founded in 1916 as a province of the Rochester Franciscans (whose official name is the Sisters of St. Francis of the Congregation of Our Lady of Lourdes, Rochester, MN), the Sylvania Franciscans became an independent Congregation in the 1940’s. They chose, however, to remain under the patronage of Our Lady of Lourdes. Mary, the mother of Jesus, has always held a special place in the hearts of all Franciscans. For Francis of Assisi the Incarnation, God’s willingness to share our human existence in the person of Jesus, was one of the most moving examples of God’s unconditional love for us. Mary’s willingness to say “Yes” to God and to be a part of that plan made her a model, then, for all of us to imitate. In fact, Francis placed the entire Franciscan family under the patronage and protection of Mary. The Sylvania Franciscans have continued this tradition as well, especially under the title of Mary, Our Lady of Lourdes. The image of Mary as she appeared in 1858 to Bernadette, a young French girl, is found in many places on these grounds. 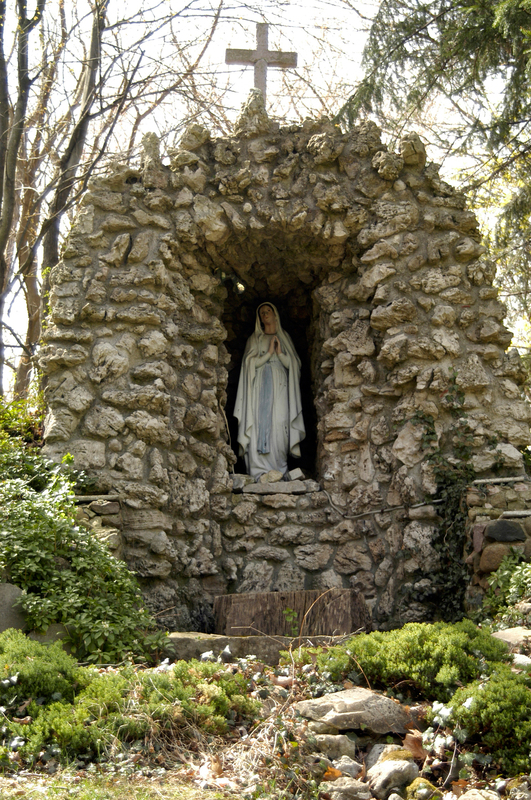 One of the first projects on these 89 acres was undertaken in 1921 with the building of the Lourdes Grotto that can be found on the west side of Campus beyond Assisi Hall. This shrine was truly a community-wide effort. 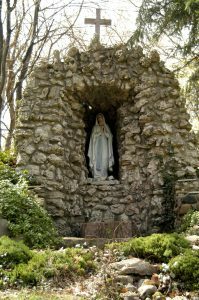 Largely planned by Mother Adelaide, the novices and postulants (young women in formation to be Sisters of St. Francis) carried the rocks from St. Francis River (the Sisters’ name for Ten Mile Creek) that would be used in the building of the shrine. 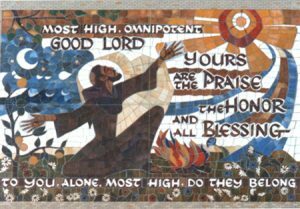 When the Franciscan Center was built in the 1980’s, the Sisters asked community artists, Sisters Agneta Ganzel, Helen Chmura, and Jane Mary Sorosiak, to design large ceramic murals to grace the façade of the building. This was again a community-wide effort as numerous Sisters assisted with glazing and other tasks. The first mural, which was placed on the east side of the building, is a depiction of Our Lady of Lourdes. When Lourdes was founded in 1958, one hundred years after the apparitions at Lourdes, France, it seemed appropriate that the institution should bear the name Lourdes. The healing spirit of Lourdes, France continues to make Lourdes a place where education transforms lives. Mother Adelaide, the founder of the Sylvania Franciscans, believed that if you surrounded people with beauty, they would grow to appreciate the beauty of their surroundings and the beauty within themselves. 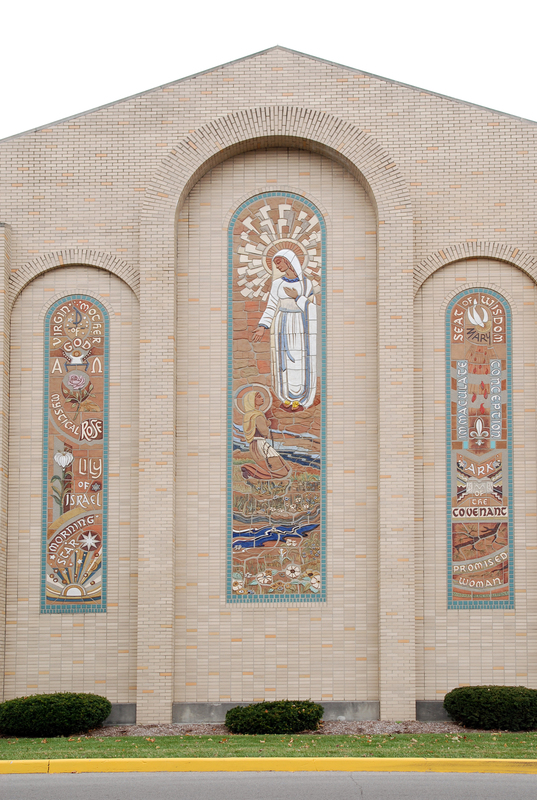 Some of the most stunning examples of beauty on campus are the stoneware murals that grace the façade of the Franciscan Center. 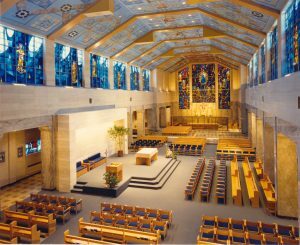 When the Center was built in the 1980’s, Sister Patrice Kerin asked community artists, Sisters Agneta Ganzel, Helen Chmura, and Jane Mary Sorosiak, to design large ceramic murals that would convey the spirit of the Congregation. Numerous Sisters in the Congregation assisted with glazing and other tasks. 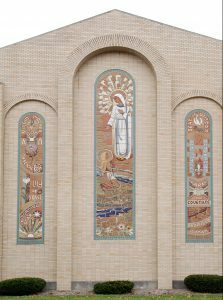 The artwork that adorns the building includes a triptych mural on the east façade dedicated to Our Lady of Lourdes, several smaller roundels and tiles on the lower portion of the building commemorating significant women in the history of the church and of education, ceramic tiles that reflect the Franciscan call to be people of peace, and a monumental ceramic mosaic that spans three sides of the building on the theater flyspace. The murals remind us, in the words of Francis of Assisi, to “See the miracles of life everywhere, and praise God.” The spirit of Francis calls us to be mindful of the beauty that surrounds us in all of creation. 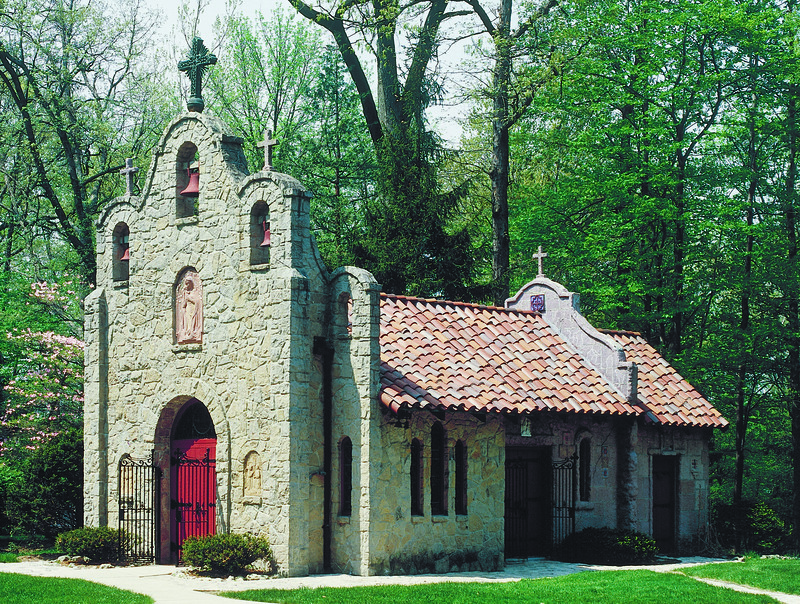 Our Lady Queen of Peace Chapel, the main chapel of the Sisters of St. Francis, also serves as the chapel for Lourdes University. Dedicated in 1961 it captures the spirit of the Sylvania Franciscans called like Francis of Assisi to live the Gospel in joyful servanthood among all people and to be messengers of peace. The chapel, modeled after the Santa Barbara mission in California, was designed and built under the direction of Mother Mary Adelaide, founder of the Sylvania Franciscan community. 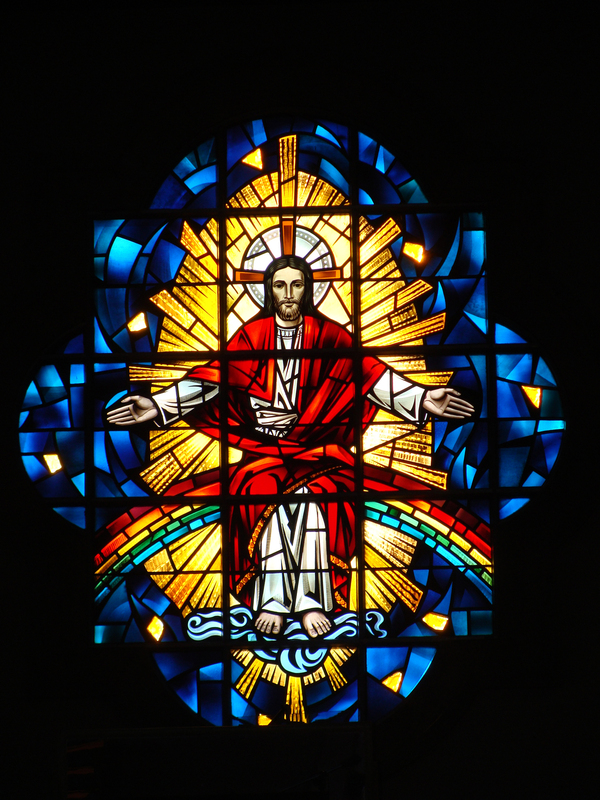 The windows were designed by Stephen Bridges and created in the Rambusch Studios in New York. Hanging beneath this window is a Sylvania Franciscan version of the Crucifix of San Damiano, an image that was dear to the heart of Francis and that holds a place of honor wherever Franciscans live and minister. This is the cross that Francis, then a young cloth merchant, was praying before in the church of San Damiano. This is the cross that spoke those life-changing words to him, “Francis, go and rebuild my house, which as you see is falling into ruins.” This particular rendition of the icon was painted by Sister Ruth Marie Kachelek using egg tempera on gessoed wood. 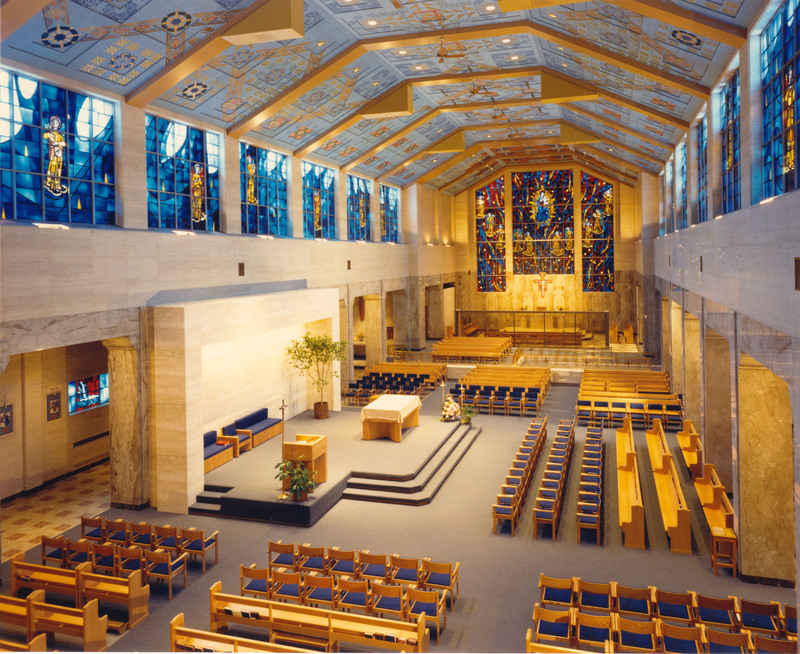 Sister Michaeline Lesiak designed the ceiling. It consists of over 10,000 acoustical tiles and represents a true community effort. Art students and professed sisters shared in the 13-month evolution from drawing to stenciled masterpiece. The chapel was renovated and rededicated in 1986. Welcomed by Mary, Queen of Peace, we go forth missioned as witnesses of Jesus, Prince of Peace. You are always welcome to join the Sisters of St. Francis and the Lourdes community for liturgies and prayer services at Queen of Peace Chapel. Please consult the monthly chapel schedule. Mother Mary Adelaide Sandusky, the founder of the Sylvania Franciscans, was a woman of vision and a lover of beauty. When these 89 acres contained little more than yellow sand and a few temporary buildings, Mother Adelaide was already making plans. Basic to her design for the campus was the Franciscan mission style of architecture. In 1927 she traveled to California to study the architectural features of this style. In addition to the distinctive red tile roofs, light brick buildings, arches, and cloister walks, the campus buildings include several bell towers. Bells have been used in many cultures throughout history to call people to prayer and to announce both sad and joyful news. If you find yourself on campus either at noon or 6 p.m. you will hear the carillon ringing out from Umbria Hall. 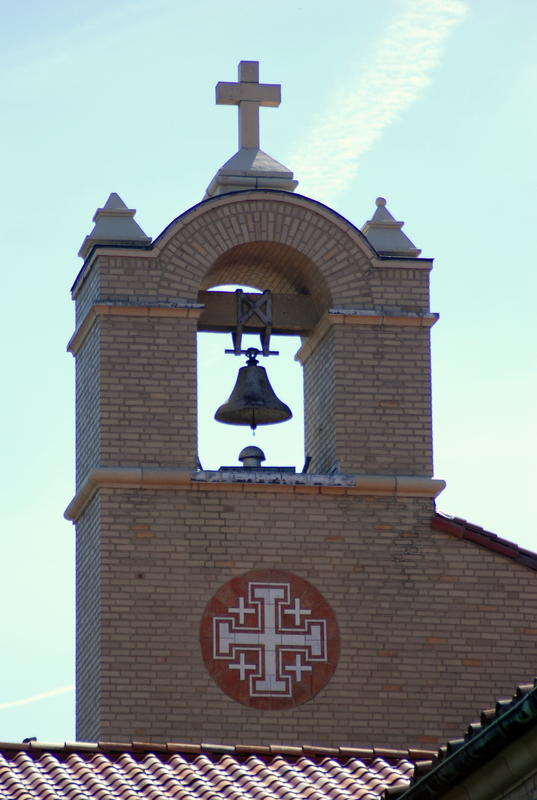 The sound of these bells encourages the listener to take a moment and to be mindful of the presence of God in our lives.